This year marks not only the 90th anniversary of the Saint Tarcissus Parish, but a time when church members are being asked to help re-shape the parish for future generations. 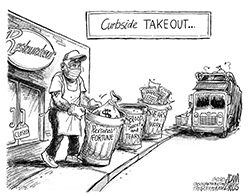 Saint Tarcissus the Reverend Mike Solazzo wrote in a recent parish newsletter that the parish is embarking on "a most serious course of change," as parishes across the Chicago area are participating in what the Archdiocese of Chicago calls "Renew My Church." About 30,000 people responded to an archdiocese survey on the challenges facing churches. "Archbishop Cupich is asking all parishes to cluster themselves with others around them to share and strengthen resources, personnel and dream big about how we can become a new and different church for the future," Solazzo, who was appointed pastor of the parish in 2011, wrote in the newsletter. The parish also is holding events in honor of its 90-year history, including an anniversary mass that was held in April. 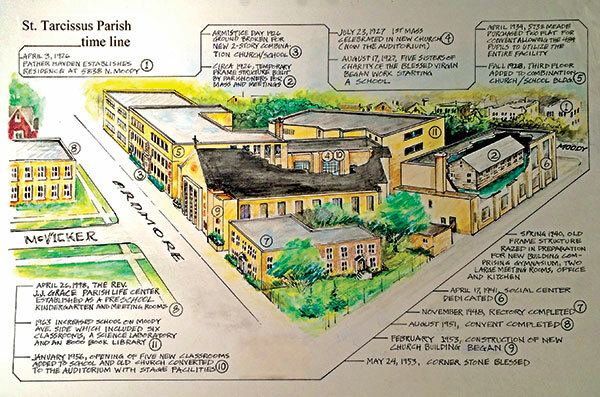 The parish also has worked with Quinn Printing to publish a book on the its history, and copies can be purchased for $20 by calling the parish office at 773-763-8228. The parish was formed on April 3, 1926. 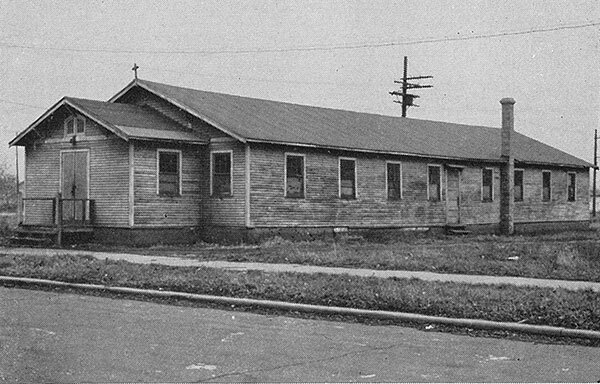 Its first pastor, Father Martin Hayden, established a rectory in a two-flat at 5838 N. Moody Ave., while parish members helped construct a temporary wooden church on a nearby parcel, where the parish social center was built in 1940. By late 1926 ground was broken for a two-story church and school building, and the first mass there was celebrated on July 23, 1927. A third floor was added to the building in 1928, and the church portion of the building now is the school auditorium. Two classrooms in the school were used as living quarters for the Sisters of Charity of the Blessed Virgin Mary until a two-flat at 5738 N. Meade Ave. was purchased to serve as a convent. 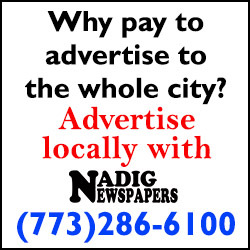 Hayden was described in a parish newsletter as someone who "never refused any requests for financial assistance from his parishioners" despite parish funds dwindling to nearly nothing during the Great Depression. He delayed construction of a new rectory because "he felt the needs of his people should come first," according to the newsletter. After Hayden’s death in 1951, Father Edward Kush was appointed pastor, and his first priority was to build a new church to accommodate the parish’s growing membership. The new church was dedicated on July 25, 1954. The next parish improvement was a five-classroom addition to the school in 1956, and in 1963 another addition to the school was built on Moody Avenue. After Kush retired 1971, Father Leonard Felczak served as pastor until 1983, followed by Father John Grace until 2000. Father Dan McCarthy became the parish’s fifth pastor, and there were several church renovations during his tenure, including a baptismal pool and font near the main church doors and the creation of a handicapped-accessible washroom. Parish member Joe DiCiaula said that over the years one of the strengths of Saint Tarcissus has been ability to attract older and younger members of the same family. "It is a multi-generational parish," DiCiaula said. "It’s the grandparents, their children and the grandkids." Providing parishes with the vibrancy and resources needed to attract future generations is one of the goals of the "Renew My Church" program. "This is a time for creative change, and change always provides opportunities for growth," Solazzo wrote. One of the changes is occurring this year, as Saint Tarcissus is three other parishes are creating Pope Francis Global Academy, which will offer pre-kindergarten through eighth grade classes. The consolidation plan is in response to decreased enrollment at some of the area’s parochial schools. Saint Tarcissus and Saint Pascal are the host campuses for the new school, which also includes the Our Lady of Victory and Saint Cornelius parishes. Saint Tarcissus’ roots date back to the older Our Lady of Victory Parish, which served the Gladstone Park area before 1926. "With the implementation of the new multi-parish Pope Francis Global Academy in the fall of 2016, our parish’s educational ministry will begin a new and exciting phase," the parish newsletter states. Shown above from the parish archives is the first church built by parishioners. At right is a timeline of the history of the parish and school. Saint Tarcissus Parish is celebrating its 90th anniversary this year.